Microdermabrasion is a simple and effective form of exfoliation for renewing a fresh young-looking glow to your skin. It is considered a mechanical or physical exfoliation removing the outer layer of dead or damaged skin cells revealing a more youthful skin. Microdermabrasion is a non-invasive treatment designed to improve the overall texture, tone and clarity of the skin while restoring the skin’s elasticity. Microdermabrasion is a treatment that improves the appearance of wrinkles, skin texture and color by removing the topmost layer of skin leaving it softer and plumper. Deeply effective exfoliation also stimulates the elastic tissue beneath the surface of the skin resulting in a healthier and firmer appearance. Diamond microdermabrasion treatment is non-invasive, pain-free and requires no down time after treatment. The length of the treatment and number of treatments vary depending on skin type and condition. Results are gradual but highly effective. Most people experience softer, smoother skin after their first treatment but for lasting effects a course of treatment is required to gain visible improvement. Your skin will improve with additional treatments as increased circulation is noted within the dermis and newer, healthier skin cells are produced. Diamond microdermabrasion - better than crystal microdermabrasion. Diamond microdermabrasion is the latest form of this treatment and has the following advantages over crystal microdermabrasion. No crystals left imbedded in the skin and floating around in the air. No environmentally hazardous material to dispose of after each procedure. No crystals left in the hair and clothes of both the patient and clinician. No need to wear a particle mask or eye protection or remove contacts. No crystals to cause irritation in eyes and airways after the procedures. Who Can Benefit from Microdermabrasion Facial? Diamond microdermabrasion offers benefits to anyone who wants to improve specific skin conditions and rejuvenate the overall health and appearance of their skin. Reduce the appearance of fine lines, acne and superficial scars from past injury, large pores and other skin imperfections. Removes dead and tired cells so your body can replace them with fresh, healthier looking skin. 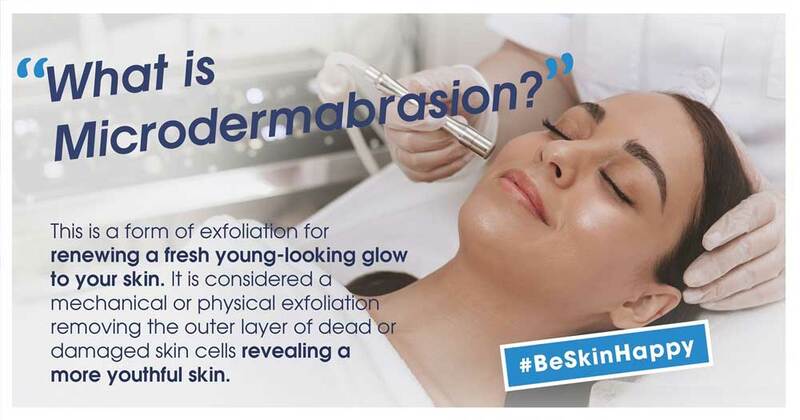 For people on the go, an exfoliation treatment using the Diamond medical microdermabrasion offers exceptional benefits. Ideal for a special event or as a program for overall skin rejuvenation, this treatment is non-invasive, painless and requires no downtime from work or social activities. Normal activities may be resumed immediately after treatment. Your skin is free of redness, irritation and particle contamination. It does not cause any pain or discomfort. Patients should come for a clinical microdermabrasion session every week for six weeks. A proper anti-ageing skin care program is prescribed and combined with microdermabrasion – this will augment and enhance the results of the treatment. Average treatment protocol is 6 to 12 treatments at weekly or biweekly intervals. How many treatments might be necessary will depend on the condition of the skin and the needs of each individual patient. Initially treatments can be performed every 7 - 14 days. Once the series of treatment is completed it is recommended that monthly or bi-monthly maintenance continues in order to maintain the desired results alongside your homecare routine as prescribed by your practitioner at consultation. Consultation with a Skin Clinician is Free of Charge at this clinic. They will assess your skin’s suitability for treatment to ensure it is right for you before booking a course of treatment. We can discuss how microdermabrasion will work for you. Consultation is free and allows you to be fully informed in a no-pressure, friendly, relaxed environment before you start your treatment.